From Memorial Day weekend through Labor Day weekend the San Bernardino County Regional Parks opens its swim complexes for families to enjoy. 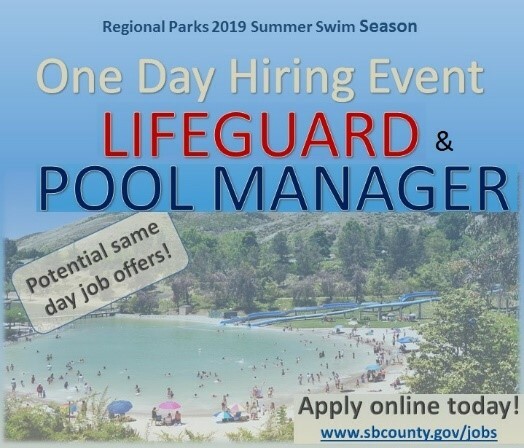 We would like to invite any interested candidates to apply as a Lifeguard or Pool Manager at one of our Regional Parks for the 2019 Summer Season. The department will be hosting a one-day hiring event on March 2, 2019 where potential same day job offers could be made. If you are unable to attend the event, applications will be accepted online continuously through April. Regional Parks will be offering lifeguard certification training in March. Candidates who are selected at the hiring event, will be able to obtain certifications paid for by the department. All applicants are required to have C.P.R. and First Aid certifications, prior to the first day of employment. Lifeguards will be required to show proof of current Lifeguard Certifications, valid through September 2019. All requirements must be met before the first day of work. Bilingual abilities strongly desired. Preferred work location is not guaranteed and will be decided by Park staffing needs. Please visit www.sbcounty.gov/jobs and apply today! Hi Leah, we’re sorry you missed our hiring event on March 2. If you would like to contact Regional Parks with questions about future openings, please call Regional Parks at (909) 387-2757 or visit wwww.sbcounty.gov/jobs for the latest job postings throughout County government. Thank you for your interest!